Did This Fluffy Chicken Really Sneeze? 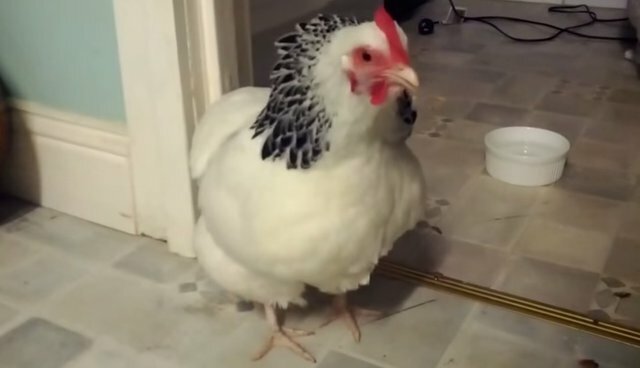 In a video that has recently spiked in popularity, a light Sussex Bantam hen named "Squeak" is seen clucking for a few moments before letting out what seems to be an impressive and startling sneeze. One night we heard this incredible noise from the coop every few minutes. I went out to check on the little darlings, half worried it was a snake or some other critter bothering them but it was just Squeak sneezing away. The others didn't seem too bothered but I brought her inside to monitor and possibly take to the vet the next morning. She spent the night in a box in the spare room and she sneezed through the night. By the morning she (w)as right as rain. Not a sniffle, so out she went and that was the end of the episode. So, as adorable as this little outburst sounded, was Squeak actually sneezing? According to Chris Bailey, a poultry nutrition professor at Texas A&M; University, it's definitely possible. "With respect to the video I might consider this a sneeze (expulsion of an irritant). It doesn't look like a disease cough to me and the chicken looks healthy," Bailey tells The Dodo. However, Bailey is quick to remark that he certainly wouldn't call the sneeze "typical behavior." Bailey muses that it's possible that this was indeed the bird's way of expelling some sort of irritant, making it very similar to (if not exactly like) a human sneeze. If it was indeed a sneeze, it was pretty darn adorable! That said, sneezing really isn't common in chickens, and probably should not be taken lightly if it occurs. If you have any pet chickens who begin to make sneeze-like noises, it is, of course, best to take them to a vet immediately, as Bailey says "An Avian vet might consider sneezing and coughing as a sign of respiratory disease such as infectious bronchitis or low pathogenic avian influenza."